I’ve been reading through The Big Switch this week. It’s what you’d expect, and what we’ve been talking about for awhile: everything goes up behind a URL, into the cloud. The whole notion, you see, is that all those company data-centers will consolidate to URLs that Amazon, Microsoft, Google, OpSource, or whoever hosts for you. You know, the old “there is no Chief Electricity Officer anymore” parlor game. It hasn’t worked in the past, but maybe we’ve got fast enough bandwidth now, the thinking goes. Who knows how over- or under-blown the cloud idea is. Part of the down in the much issue rests on the question of how much the cloud idea is about hardware running in the cloud vs. software running in the cloud. The clear-cut thinking of running your business off a URL gets fuzzy when you try to think-out the use case of “user wants to install their own application in the cloud.” Hint: answering with the typical Cloud Cult response of “why would user want to do that” doesn’t work. Adding to the fuzziness is the problem is that most of the yeas and nays boil down to cultural issues rather than technological ones, so it’s hard to plot out the possible success of the idea. I fall pretty hard on the positive side o, but I also realize that both the cultural and (possibly) even legal requirements for data security are huge barriers to people even taking the idea of URL-based computing seriously. Maybe the rest of Carr’s book will argue the case more forcefully, or in a more effective way than all the cloud watchers (who we, of course, count ourselves in the ranks of and love dearly) have done over the past few years. This dog’s gotta hunt sometime soon or it’ll just be next year’s SOA. Recently, I was talking with an architect at an IT management vendor. He asked about some new technology ideas, and like any good politician or analyst, I answered the question I wish I was answered: what should we be doing about all this cloud business? The main thing I’d focus on is creating a ubiquitous, extremely secure, and very fast connection between firewall’ed corporate networks and the cloud. Just that simple thing, for now: a pipe between all the IT behind a firewall and all the IT in the cloud. Inherent in that are the agents/proxies/loading docks on each side to handle the data being sent over that pipe. I see several ISVs using ESBs, particularly Mule, to do this now. Iona tells me that some of their clients – particularly those with lots of “branches” – do this as well. Of note, cloud culter extraordinaire Bill de HÓra has been more a fan of XMPP. Each person, project, or ISV seems to customize how this secure cloud pipe is done, however. It’d be better to just use some off the shelf thing. Well, it seems like it’d be better. After that, cloud IT management becomes a mix of network management and replicating the usual stuff for use in cloud-based and hybrid data-centers. An organization needs network management to make sure it’s network connection is always up, being used without waste, not hacked, and otherwise never breaks. You still need identity and application provisioning – adding and removing users, adding and removing applications (or features of existing applications). Also, you need the usual stuff is keeping the IT and your cloud providers honest (SLAs, reports, etc.). There’d be a burgeoning market in, sort of, trust arbitrage: some organization is hosting all their IT in the cloud, but doesn’t trust their cloud provider. So they spend more money to buy tools with a 3rd party to verify that the cloud provider stays honest. Really, this is how IT departments are treated now-a-days, internally: the rest of the company demands reports and whatnot to prove that IT isn’t ripping them off. The positive version of that is IT demonstrating how they create “value” (contribute to revenue, if not profit) for the overall organization. And then, once data and process are more centralized, there’s all the possibility for new and whacky was of doing things. The possibilities for tighter integration and collaboration (see last week’s RIA Weekly for more details) look fantastic. But that’s so far off that lengthy speculation is more good fun that the low-risk strategy that Big 4 types crave. If this cloud scenario is anything, I’d look towards IT management providers who can support multi-tenent deployments with “web scale” capabilities. You want this because IT management vendors will be selling to the handful of cloud providers out, not to the thousands of behind-the-firewall data-centers that currently exist. The cloud providers then, in turn, OEM or “re-sell” the IT management software to the cloud customers. That’s the plan for Cloud Management vendors like eVapt. I’m not sure any of them really have “web scale” out of the box, but there are teams of people who can probably help you with that. Relying on “teams of people” sounds bad at first, but if things pan out in a Big Switch sort of way, there’s less primary customers (only a handful – five? – of cloud providers vs. thousands of enterprise data-centers), and thus requiring teams of people potentially scales better. When it comes to the multi-tenent architecture, you’re hard-pressed to find many providers who talk about that. People like FiveRuns inherently have this, but the IT Management as SaaS providers out there are getting harder to find. I know BMC has it stuffed in a closet somewhere, but only because I used to work on it. New people like OpSource, of course, are multi-tenent from the beginning. Disclaimer: Iona, MuleSource, Microsoft, and BMC are clients. Categories: Enterprise Software, Ideas, Identity, Systems Management. Building and deploying custom software in the cloud is just around the corner. Witness the Google Mashup Editor,AppJet, or my own project, Heroku. "or it’ll just be next year’s SOA" and "I see several ISVs using ESBs" … while I know that ESB != SOA, there's a interesting dichotomy in these two thoughts – is it just that SOA has left the headlines? Not a bad photo considering it was taken with my old Mobile 5 phone. 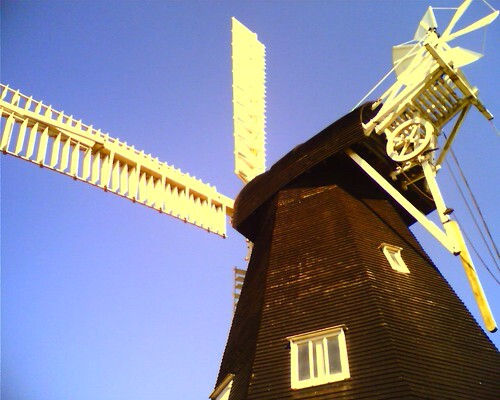 Apparently the only commercially operating wind mill left in England, and our local flour supplier. Ric: yeah…I keep thinking that ESBs are the pragmatic, winnowed down implementation of the grandiose ideas of SOA. Kind of like EJBs vs. POJOs. A post or some podcast babbling is called for! Yes, Cote, it's happening big time. Greater bandwidth is making it easier to outsource many managed services. More and more software as a service (SaaS) companies are selecting to outsource the infrastructure and day-to-day operations. SaaS vendors just want to focus on building great applications and attracting online users. They gladly leave the complex operations function to expert service providers like http://www.OpSource.net. This makes sense since they're software engineers, not operations specialists! Thought you'd like to know that I've written on "The Big Switch" as well from a network engineering/IT perspective. I think you'll like the second one in particular, as it deconstructs an argument in "The Big Switch" that Second Life represents "Gaming as a Service" and that that represents a new trend. Re "The main thing I’d focus on is creating a ubiquitous, extremely secure, and very fast connection between firewall’ed corporate networks and the cloud." See an article titled Building a Multisourced Infrastructure Using OpenVPN in Feb2008 issue of Linux Journal – it's exactly about secure connection between corporate networks and clouds. Brian: thanks! I saw both of those in my feeds (being subscribed to you, of course). You're right on that "a faster cloud end-point" will always be important. Whether that's faster network connections, graphics cards (for games), or whatever. As I've mentioned several times, I think the interesting thing is to figure out what IT management will become, instead of freaking out about that change. It's like off-shoring software development: you can yell all you want about it, but it's better to ready yourself for the day you get a pink-slip and need to figure out getting re-hired at the same pay-levels. It's the privileges of high-paid jobs in the 1st world, I guess: innovate yourself or die. Which brings up one of my favorite books on the topic: Fear of Falling. Dmitry: Thanks! I'll try to check that out somehow. I don't subscribe, so I'll have to weasel the text out.